There aren’t many of us who love winter – and it can be the same for our dogs. Even if they can’t wait to head out for playtime, the icy mornings, biting wind and general lack of sunlight can certainly make it hard to leave the house. And if you’re feeling the cold, it’s more than likely that your dog is too. Especially if it’s snowing. But that doesn’t mean you can’t have fun together! There are lots of things you can do indoors which both you and your dog will enjoy. Below you’ll find our top favourites which are all great ways to spend time with your dog. We love a movie night. There’s nothing better than curling up on the sofa and getting settled in with snacks and blankets – it's the ultimate night in! And there’s no reason why you can’t use it as an excuse to cuddle up with your dog – after all, the average dog needs around 12 to 14 hours of sleep a day! So, relaxing together means your dog can snooze by your side while you keep one eye on your favourite film. Pick a movie that’s relaxing to watch and if you’re in your onesie, make sure your dog is snuggled up too with a dog blanket or a brand-new dog bed! Grabbing some extra snacks? Make sure they’re dog-friendly with our guide to what dogs can and can’t eat. If your dog isn’t getting as much exercise as usual, then it’s important to make sure you get in some extra activity time to help them burn off some energy! Playing a game is perfect for doing this. Things like tug-of-war are great. All you need is a rope toy and you can join in the fun! Games like these not only help your dog strengthen their jaw, but it’s great for bonding as well as training your dog. Make sure they have your permission before they grab the rope and reward them when they get it right. This is really useful in terms of training your dog as well as giving them some mental stimulation as you play. Making your dog a special homemade treat is a really nice way to help them feel really loved. And it’s also a really nice thing to do at home when the weather’s not quite on your side. Why not whip up some biscuits and then use them to reward good behaviour? Whisk the yoghurt and peanut butter together until it forms a paste. Add the oats slowly, making sure that they’re fully coated and no dry spots form. You’ll be left with a heavy mixture. Scoop out bite-sized pieces with a spoon and roll into balls – you should be able to make around 30. Put the balls on a flat tray lined with baking paper. Pop them in the fridge for an hour to chill and set - then it’s time for your pup to tuck in! These treats will last between 7 and 10 days when stored in the fridge. Mental stimulation is just as important as physical exercise for your dog. And chances are, if they haven’t been able to get out as much as normal, then they’re missing out on all that exploring and game-playing. So, why not use this time to teach them a new trick? It’s fun to do, keeps your dog interested and is a great way to bond. It’s also something you can keep up throughout the year and build on with more tricks as you go. Spin – get them to spin round for their treat! When you’re stuck indoors, sometimes the best thing to do is embrace it. And what better way to make good use of the time than to have a spa day! Now. Your dog may love baths. They may hate them. But having a spa day doesn’t just have to be about having a wash! As well as all the necessary things that you do to help take care of your dog, finish off all the washing and clipping with something relaxing. Grooming their fur, giving them a doggie massage or simply stroking them gently while keeping them warm is a lovely way to spend time. Why not go all out and set the scene with some relaxing lighting and music. Your dog will really enjoy the calm atmosphere as well as having all your attention on them! Looking for more ideas and inspiration? 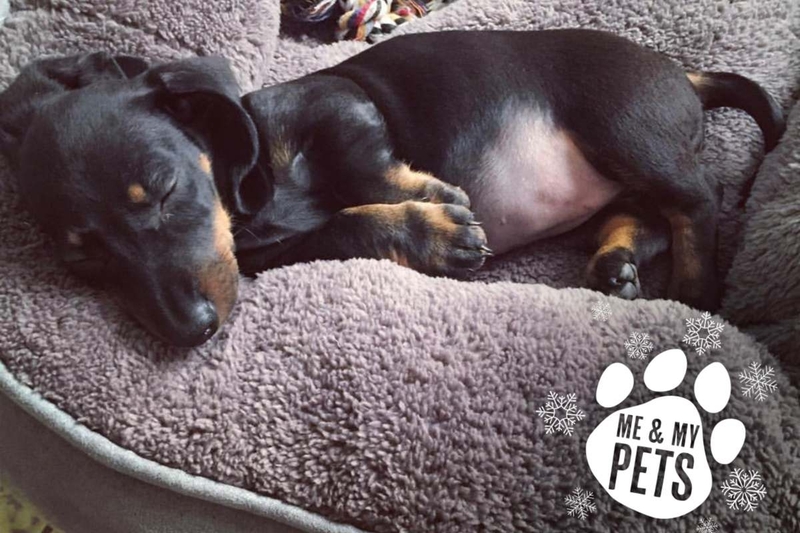 Head over to our Instagram and Facebook pages @meandmypetsofficial.